As planning began for the 2019 Polar Plunge, DG Bob Wood agreed to "take a dive" for the effort, allowing a caricature to be used to follow the progress of the District's fundraising this year. As of April 4, we have raised $99,432 of the $125,000 goal set last fall. It's not too late to donate to the plunge. 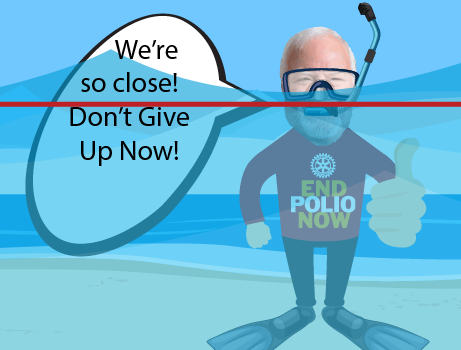 Contact your Club's Foundation or Polio Plus Chair for information on how you can donate to Rotary's signature program.